Close To My Heart has released the July Special - Early Bird Sign-Up Special. 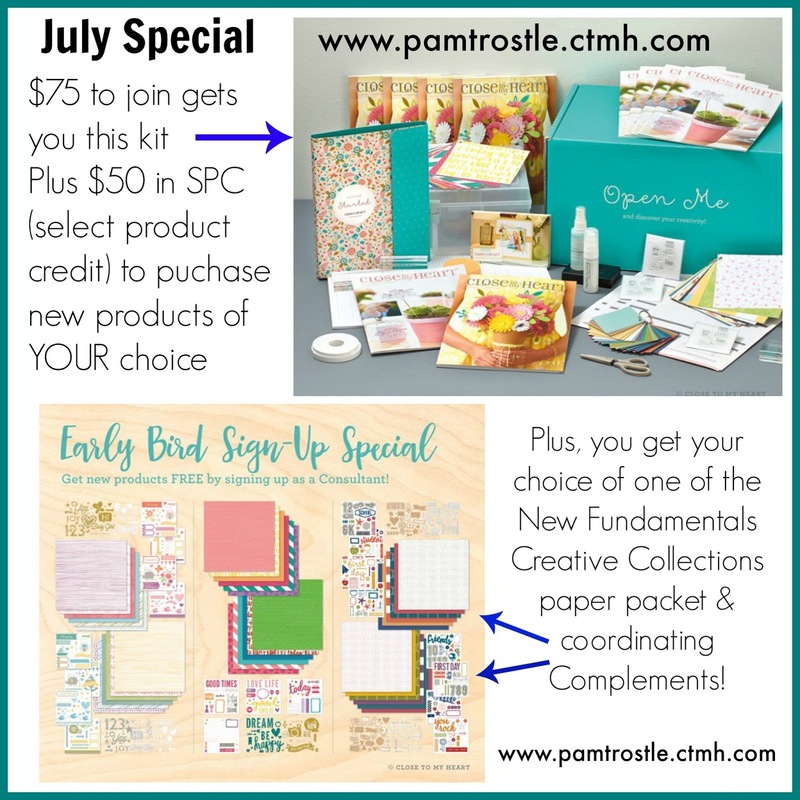 Starting July 1st, anyone who signs up to be a CTMH Independent Consultant will get their choice of New products not yet released to the public!! I didn't get to go to Convention this year, so I have only seen sneak peeks of the new products, but what I did see, Oh My Goodness, I was reminded of why I love Close To My Heart!! For only $75 when you join, you will receive the new consultant kit which contains the Medium Organizer filled with crafting and business starter goodies, Plus you will receive $50 in SPC - Select Product Credit, which means you get to purchase new products of your choice to get your business started off with. Not only that PLUS you get your choice of one of the three New Fundamentals Creative Collections Paper Packet & the coordinating Complements!! Message me at pamtrostle@msn.com with any questions you might have! I would love to have you join my team! Not interested in building a business, well you can join as just a hobbyist to get a wonderful discount on the amazing products you already use and love! Only 4 Days left of the Flash Sale!! The CTMH Home Office has extended the Flash Sale through the end of the month! So you have 4 days left to take advantage of these wonderful bundle deals, 20%, 25% & 30% off!!! Click on any of the pictures below to order yours today before it is gone! June Special - Flash Sale! !